If we examine it from the viewpoint of evidence of document, evidence of theory and evidence of reality, there is not the question that priest Nikko is the just successor of the root Buddha Nichiren Daishonin in the latter day of the Law. For example, in "the list of Gohonzon of the handwriting that Byakuren gave to disciples " which priest Nikko wrote in 1298, it is written priest Nikko applied for 66 Gohonzon to Nichiren for the conferment to disciples and believers. 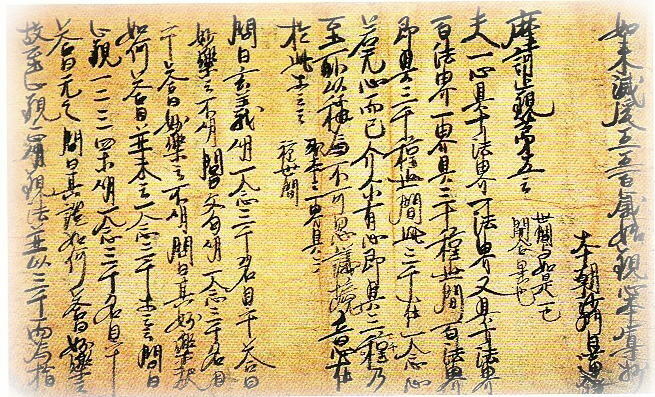 The fact of "receiving a wish and giving" on the conferment of Gohonzon of such Nichiren handwriting is not seen in the five monks at all and can conclude that Nichiren permitted only Nikko it. Gohonzon of verified Nichiren handwriting extends to more than 130 to date. Although there are a lot of examples that priest Nikko adds a postscript such as the names of the recipient to these Gohonzon, the example which the five monks write a postscript does not exist at all. For example, such the postscript of priest Nikko is written in Gohonzon which was conferred on Abutsubo of Sado, it is possessed in Myosenji temple of Sado city now. "Nyozyakubo Nichiman, the boy of Abutsubo of the leader in the Sado country Lotus Sutra believer, inherited this". In addition, 'the explanatory note of the Lotus Sutra' by Nichiren himself related Tientai's 'the Words and Phrases', 'the Profound Meaning', 'the Great Concentration and Insight', and many Buddhist sutras, and these are written to the 2017 spaces between or back side of the sentences of the ten sutra of the Lotus including the opening and closing sutra that Nichiren possessed in his lifetime, it is possessed in Tamazawa MyohokkeJi temple, then there are three examples that priest Nikko wrote in now. In this case either a place that five Buddhist priests wrote in is not seen at all. Contrary to this example, 'the writing to cogitate in a dream' where Nichiren wrote down the dream that Mongolia leaves for Japan on the back of 'the Treatise for Spreading Peace Throughout the Country by Establishing the True Teachings' which priest Nikko copied is discovered. Judging from these facts, Nikko accompanied with Nichiren at the time of Izu and Sado exile, and he always had conformed and assisted, like a shadow snuggled up to the body. Even if we say Nikko had embodied "a teacher and a disciple are not two people", it is not exaggeration. Nikko transcribes Gohonzon of 302, only confirmed now, among lifetime and is conferring it on disciples believers of the same discipline, about either the case of transcribing of Gohonzon. In comparison with this, Gohonzon which five monks transcribed had been hardly left. Nichiro is 21, Nissho is 2, Nikou is only 2. In addition, Niccho severed the ties with Jonin of the foster father in 1293 year of the evening of his life, and went to the Omosu school Nikko founded and studies under Nikko. In addition, Nichiji goes to Ezo and Karafuto for propagation, and the handwriting of the Gohonzon is not confirmed. Nikko remonstrates the attitude of five monks about the Gohonzon which teacher Nichiren expressed, as follows in 'Well-known facts of the believers of the Fuji sect'. “And one more thing. All the five people say. They already established it saying that they worshiped a Buddha as the object of worship and must present it. Therefore, there are insisting person in disciples or the supporters as follows. 'There is the writing of teacher Nichiren preaching offerings about the Buddha statue making'. In this way, they make a temple frequently or enshrine a Buddha statue or put Fugen and Manjushiri Bodhisattva as an attendant image of Buddhist statue. They hang Gohonzon of the saint handwriting in the back of this Buddha statue in this way or put this to the corridor of temple, and remain indifferent. And one more thing. The information that they trace the Gohonzon of the handwriting and carve to a woodcut, confer it on the crowd of unbelief, and think lightly of it is transmitted from various places. They are so-called Nikou, Nittyou, Nissyun”. The object of worship is Shakyamuni Buddha to the last in the case of the five monks, they write " Put this in the back of that Buddha statue in regard to the Gohonzon of the saint Nichiren handwriting". The attitude toward Gohonzon of such five men is itself style of the Ikegami Honmonji Temple where Nichiro became the founder. They enshrine the statue of Nichiren into the main hall of the Ikegami Honmonji temple and they advocate the mandala of the ten worlds of Nichiren handwriting, but put the statue of Buddha as a object of worship before the mandala magnificently. Unfortunately, but this quite becomes the best evidence that Nichiro did not understand fundamental doctrine of Nichiren. In addition, Nichiro and Nissho and Nikou were hardly able to copy the Gohonzon. This is because they did not have the qualification of succession to copy the Gohonzon of Nichiren in the first place. Therefore, it is guessed that they slightly copied by watching someone do it and most of them engrave the Gohonzon of Nichiren expressed into a wood block and print and conferred it on their believers. To be continued to 'Nichimoku Shonin, The Top Priest of the Whole World'. The last religious precepts of these 26 items are not Nikko's thought. These are the things which gathered teachings of teacher Nichiren to the last, and there are all the reasons of each item to writings which Nichiren left, and these all items are based on the spirit questing for Law that we must not violate teachings of the root Buddha Nichiren of the latter day of the Law even in one character or one phrase either. It is written in the beginning "The doctrine of Fuji should not be different in the least from the propagation which the former teacher performed". “14. In the case of the priest like "One's body is insignificant, the Law is heavy", even if he was the Buddhist priest of the ignobleness, you must respect him by the reason of "Showing him the same respect you would do Buddha." 15. Even if he is a lowly person, in the case of a Buddhist priest of propagating the Law, you should think him to be an old priest with virtue. The strong thought that Nikko entrusted the disciple believer of after ages with is coming from these three articles. These are saying. We should learn justice of teacher Nichiren without regard to the difference in viewpoint and difference in social position and a person according to that justice looks up as a teacher and should worship him, let the root and origin through "the Law" that Nichiren established. “17. If he differed from the Law of Buddha and established a willful doctrine even if he was chief priest of that time, you must not adopt this. 18. If Law of Buddha has a difference even if it was a resolve of large number of people, the chief priest must defeat this”. These two items embody the principle of "relying upon the Law and not depending on a person" which Nichiren described as follows in 'The requiting to favors' definitely. "'Rely upon the Law', it means all the Buddhist sutras. 'Not depend on a person ', it means Manjusri Bodhisattva, Hugen Bodhisattva and the various teachers other than Buddha." "The ceremony of the holy funeral service" of this time imitates "the holy funeral service record of the sect founder" that Nikko recorded "the ceremony of the holy funeral service" of Nichiren by himself. Nichigo appointed from Nikko as one person of the new six priests of virtue does written record as "the funeral record of holy priest Nikko", and this is possessed now in Hota Myohonji Temple. It is listed in following "the funeral record of holy priest Nikko" that Nichigo write that a then disciple or believer, for example the three children of Tokimitsu Nanjo, or the older brother who died young, of Nikko participated many. “The funeral record of holy priest Nikko. (The Buddhist name of the word of Nichi, we add this). The time of Ox in February 6, namely the early morning of 7th, the second year of Shokyo era. Priest Nikko passed away at 88 years old in the Omosu volost of the foot of Mt. Fuji in the country of Suruga. We placed him in the coffin at the time of bird, a.m. 5:00 to a.m. 7:00, on 8th of the same month. The order of the funeral service at the hour of the dog, p.m. 7:00 to p.m.9:00, on the same day. The torch of front the lay priest Sabrotaro..
Next, the lunchbox the lay priest Yataro. Next, the great treasure flower. the lay priest Magoshiro. Matajiro Izumi toward the right hand. Next, the lantern the lay priest Nirei-sabro. Next, the incense the lay priest Shiro Yui. Next, the bell Shiro Ishikawa. Next, the flowers Hikohachi Nishiyama. Same as above TaroYoichi Akiyama. Same as above Taro Onodera. Same as above Magojiro Ishikawa. Same as above Daikuro Yui. Same as above Saemon-shichiro Nanjo. Same as above Taro Saemon. Next, the writing desk. the lay priest matajiro Yamamoto. Next, the vase Yui Yagoro. Next, the holy sutra the lay priest Yoichi Akiyama. Next, the Gohonzon Saburo Ishikawa. Next, the papier-mache statue Goro-saemon Nanjo. Next, the trip basket horse. the lay priest Umaki Saburo. Next the horse of trips. the lay priest Sabro Umaki. Next, the horse which was decorated. Yaheiji. Next, the horse which was decorated. the lay priest Kaji. The duke of Daishin, Nichizyo. The front row Jorenbo, Nissen. The duke of Omu, Nichiju. Right. The duke of Suou. The duke of Jiju, Niccho. Left The duke of Sanuki, Nichigen. The back row Renzobo, Nichimoku. The populace of the remainder is the other row. Next, the long sword Goro Ogi. Next, the sword Mtajiro Izumi. Next, the bow and arrow. Kosabro Ishikawa. Next, the bamboo hat. Okugoro-zhiro of the lay priest. Next, the clogs the lay priest Tonari. Next, the torch of the back row. Toshiro Kino. Distribution of the property omit. Nikko delivered the doctrine of Nichiren to Nichimoku of the next generation in this way and handed down it to the future generation without running out of a bloodline of succession of Kosen-rufu. Besides, Nikko determines six new priests of virtue right before passing away and ensures 'perpetuation of Law' because Nikko lived long with 88 years old and lost most of six priests of virtue he established. The name of the new six priests are written down in 'About the Nichiren Sect' which was written by Nissei of 17th chief priest in Daisekiji as follows. Nichidai (founder of Nishiyama Honmonji temple), Niccho(the first scholarly chief of Omosu), Nichido(fourth chief priest of Daisekiji temple), Nichimyo(second priest of Kitayama Honmonji temple), Nichigo(founder of Hoda Myohonji temple), Nichijo (founder of Omosu Nishinobo). Nichiren of the teacher called Nikko "a person who rescue for ten thousand years" or "a person who pour the water of Law into the pot" and, also called him " the great leader who was entrusted the radical teachings to". A 'pour the water', it means that the person transfer the water of Law for future without wrong in such a way to pour the water to the pot. A "entrusted the radical teachings to", it means the ceremony where Shakyamuni Buddha granted the Law of essence of the latter day of the Law to Jogyo Bodhisattva of leader of innumerable bodhisattvas of emerging from the ground in the Lotus Sutra. The Law of essence is the daimoku, title, of Nam-myoho-renge-kyo. I write down the next progress of Hakiri family from now. Hakiri family who was also said to be Nanbu family was caught up to the battle of the northern and southern dynasties after Kamakura Shogunate extinction. They took side of the south dynasty of the Godaigo Emperor and fought, but were defeated to the north led by Taka'uzi Asikaga. After unification of the north and south dynasties too, Nambu family did not serve the Ashikaga north dynasty. In 1393, the Nanbu clan abandoned all of the feudal tenure at last, and they left for far-off Tohoku. It is the 104th year Nikko went down the mountain. In addition, there was the clan of Hakiri who protected Kuon temple of the Mt. Minobu which Nichiren had built, but, in 1527, they were subdued by father Nobutora of Shingen Takeda, and Hakiri clan of this land was completely ruined. The reason was the crime that Hakiri was secretly connected with Imagawa of Suruga in the neighboring country. There will be it according the sutra; "Who spits against heaven, it falls in his face." "Shame take him that shame thinks. " Nikko left the world at 88 years old on February 7, 1333, 52 years after Nichiren passed away. It may be said Nikko had surprising long life when we consider Nikko lived a severe exile place in Izu or Sado with Nichiren and moreover consider a situation of the times that famine and an epidemic spread all over. There was not the five monk anymore in the world in this time. Most elder Nissho was dead at 88 years old ten years before of Nikko. Nichirou dies at 76 years old 13 years ago, and Niccho is 66 years old 16 years ago, Nikou finishes a life at 62 years old 19 years ago. In addition, Nichiji is thought to have died in a Karafuto or Ezo land. On May 1 of this former year, fighting with the persecution in Atsuhara together, Tokimitsu Nanjo who could be said with the friend of Law beyond the relations called a priest and the believer finishes 74 lives. It is strongly guessed the reason why Nikko was longevity is because there was a mission of making sure of a solid foundation being performed for the sanctuary of radical teachings coming true in Daiseki field of great Nichiren Huashan, the foot of Fuji, by the will of teacher Nichiren. In 1333, the great matters happened together inside and outside. Takauji Ashikaga revolted against the Hojo shogunate as having waited for death of Nikko on April 16. Yoshisada Nitta entraps Kamakura on May 21, and Hojo dies out on the next day. Emperor Godaigo went back to the imperial place of Kyoto, and, on June 5, new government of the Kenmu era began. And Nichimoku of the third chief priest who inherited from Nikko on November 15 left for Kyoto for the remonstrating to the emperor, but it was tragical and entered nirvana in a place of Tarui of Mino country and showed an everlasting example to the disciples of after ages. Nikko yearned for Nichiren of the teacher at the time of end dropping into drowsiness. Time of 88 years flowed, but, strangely, only the memory of the teacher is left. He met the teacher at 12 years old and received the name of Nikko. Thereafter he followed Nichiren to Kamakura, Izu, Sado, Koshu as if the body and a shadow. That fruitful days still dwell in his mind. When he recalled, teacher Nichiren changed suffering to pleasure and was the magnificent personality to lead the populace to the hope. The happiness that there was near him. This joy does not fade away in eternity for Nikko. He was engulfed by sadness at the same time. “Oh, when can I meet the saint again?”. It was said that Shijo Kingo had cried in the sorrow of parting in Tatsunokuchi, Nikko was the same again. Nikko says grace to Gohonzon which was left by the teacher. There is the following verse to the chapter of phantom city of the Lotus Sutra. After the Buddha entry into Nirvana. The person who heard these various Law. On the land of various Buddha of everywhere. He is always born with a teacher. It says that disciple will be born in the country of same Buddha with a teacher in the next life, and come across the teacher. Nikko engraved this sentence of the sutra on his mind and chanted the daimoku. He was anxious for seeing the teacher again so that the dry field wanted gentle rain. “Be that as it may, I could see the teacher at this world surprisingly. If the teacher did not visit the Jissoji temple of Iwamoto, it was not me of the present. No, I was able to come across the teacher beyond the stream of time surprisingly. It is said that Law of Buddha performs no miracle, but will there be such chance again? This is rare than person watches the flower of the fig that blooms once in three thousand years than the tortoise of the one eye comes across a numinous piece of tree in the ocean. I am truly a lucky person!”. The night sky of the Ueno volost was a star of the ten thousand. Nikko became one of the stars of the vast universe and stared at himself.